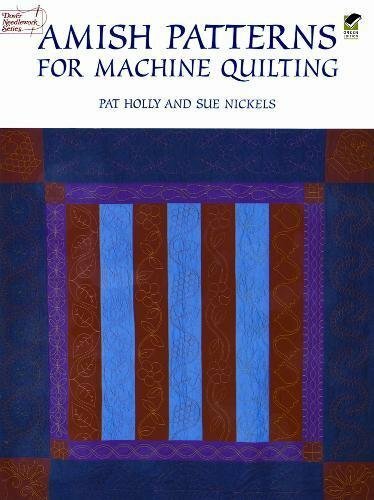 In this easy-to-follow guide, Pat Holly and Sue Nickels share a host of striking designs inspired by antique Amish quilts. Their simple, step-by-step instructions show you how to use a sewing machine to quilt these elaborate patterns in just a fraction of the time it takes to sew them by hand. You’ll find a treasury of stunning designs, including flowers, feathers, cables, baskets, stars, and more. Even those hard-to-fill spaces in between blocks and along quilt edges can be transformed with elegant sashing designs and attractive border decorations such as a grapevine and a running vine. You can use the patterns exactly as they are or easily adapt their sizes and shapes to fit your quilt perfectly. In addition, some of the patterns can be used for appliqué design. A short history of the Amish precedes a section on how to use the designs and a brief explanation of machine quilting. Most patterns are accompanied by simple directions for needlecrafters who enjoy the convenience and speed of quilting by machine but who can, if they wish, also create these heirloom-quality designs by hand.